The TMNT, April and Oyuki are working with Kid Terra and his allies to try to locate Master Splinter, Donatello, Raphael, Ninjara, Future Raph and Future Don. We discover that the spaceship carrying the others was intercepted by U.S. Air Force stealth planes and forced to land at Area 51, a top secret base in the desert of Nevada. Raph, Don, Splinter, Future Raph and Future Don were taken into captivity at the underground base. Fortunately, a janitor there is one of Kid’s friends and calls the cowboy to tell him what he saw. Back at the base, the Turtles are interrogated. Raphael goes ballistic, which gives Future Don a chance to try to escape. As he runs through the base trying to get his bearings, Future Don discovers a captured alien. Don tries to pick the lock to free the being, but is thwarted by armed guards that take him away. Unbeknownst to the soldiers, Future Don had succesfully picked the lock, freeing the alien from its cell. As the general chastises Raph and Don for being uncooperative, the alien arrives and psionically paralyzes him. Our heroes make their escape and battle guards on their way to freedom. 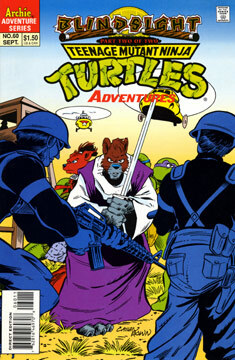 But once the Turtles reach the surface, they’re met by the general and a horde of armed soldiers. Suddenly, Kid Terra and the others arrive in a helicopter. Terra tells the general that he’s come to take his friends home. The general states that he’s willing to give up the Turtles if they hand over the alien – Future Don protests, but the alien sends him a telepathic message that it’s okay. The Turtles are allowed to leave as the alien is taken back inside the base. Future Don promises to return for his alien friend and as our heroes are escorted off the base in pick up trucks.